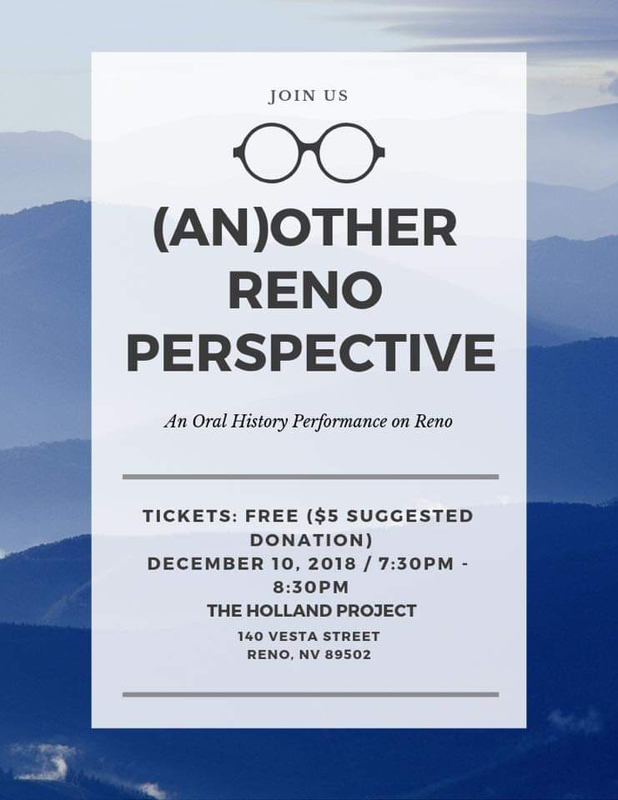 (An)other Reno Perspective is a 60 minute oral history performance created by the students at the University of Nevada, Reno within the department of Communication Studies that investigates the following research question: What does it mean to be an “Other” in Reno, NV? Inspired by performance artists Guillermo Gómez-Peña and Tim Miller, this group of researchers utilized in-depth oral history interviews with local community members, peer-reviewed scholarly journals, newspaper articles, poetry, prose, song, and historical writings to present their findings in an accessible, engaging, and transformative method of sharing research. As a research team, we wanted to do work that matters, that makes a difference in our communities, and that engages the rapid economic, political, environmental, and cultural changes of our local/global world. This free event will be collecting donations for The Sylvia Rivera Center for Social Justice, which is a local non-profit that provides advocacy, education, legal, and mental health services to marginalized and oppressed communities in Northern Nevada. In this performance project, we invite you to consider the ways otherness and othering work within our community, and we challenge you to confront the ways in which we contribute to the marginalization of our neighbors and fellow Nevadans. We ask that you consider (an)other Reno perspective. Doors at 7PM and performances begin at 7:30PM. A $5 cover is suggested for donation.